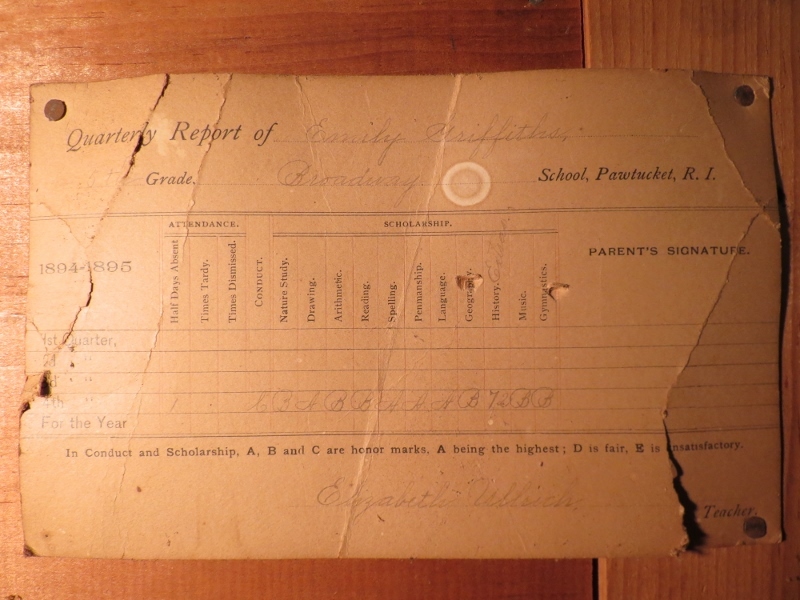 Recently, I found my great-great grandmother's (Emily Griffiths) 5th grade report card from 1895 nailed to the wall in the attic over the garage (don't ask me why it was there, I took it down and put it in a safer place pending my ability to get it preserved). Anyway, most of it is pretty easy to read, but unfortunately I have always had trouble reading cursive, especially in isolation. I can't read the last name of the teacher (Elizabeth W(?)....ich? 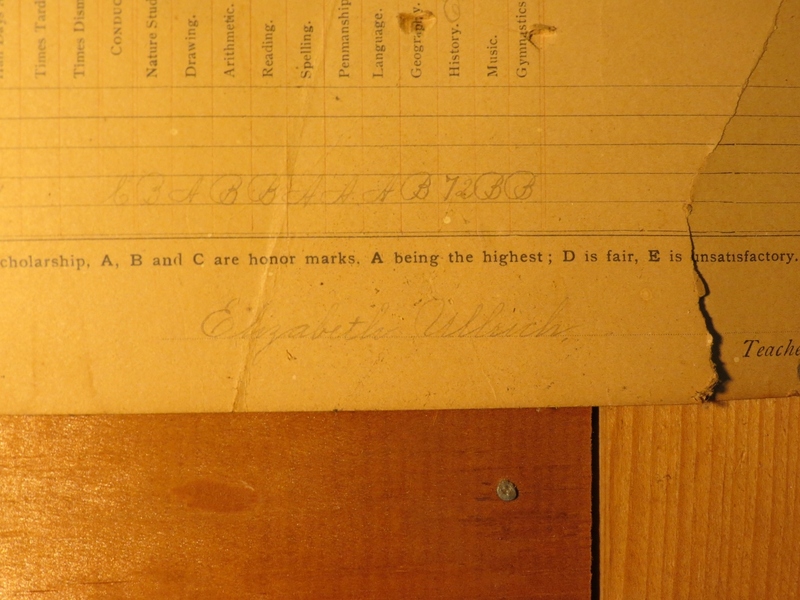 ), what grade Emily got for "Conduct", or what word is written after "History" under the listing of the various classes. Presumably that word explains why history is the only class were a numerical grade was given. I have attached two different images showing the report card. Note that I had to reduce the quality so that the file size would be small enough to post on here. Could someone who can read cursive better than I can please identify the indicated words? The teacher's name is Elizabeth Ullrich. From the report card, we can see that the school was in Rhode Island. There is a report titled RHODE ISLAND SCHOOL REPORT, prepared for the Rhode Island Board of Education which lists School Officers and Teachers in Public Schools in 1894-95 which includes Elizabeth Ullrich as a teacher in 'Grammar, Intermediate, Primary, and Ungraded Schools' in Pawtucket. The grade for 'Conduct' was a C.
I think the C for Conduct is clear. The teacher's name is the hardest to read. I thought it might be Sellick but @sempaiscuba provides strong evidence for Ullrich so I would readily accept that. Ullrich is the teacher's last name. Looks like "extra" after "history" (extra credit, it looks like 72 in box). The student is Emily Grittiths 1894-1895, Pawtucket, RI. Emily had all A's and B's on this report card. Not the answer you're looking for? Browse other questions tagged united-states palaeography rhode-island or ask your own question. How can I find out the name of this street? Old German script. What is the wife's name in this 1837 baptismal ledger from Stark County, Ohio? Does the name on this record say Nikiefor? What is written after John Lark's name? If mother's maiden name is listed as same as child's last name, is child illegitimate?